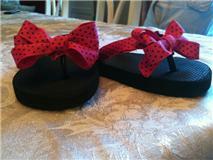 I want to share the flip flops I made using ribbon for my DD. All you need is a pair of flip flops, ribbon and glue. Enjoy!!! !